As a mom of 3 small children in the Greater Sacramento area, we stay busy. We are constantly running from school to sports practices, doctor’s appointments, play dates, the list goes on and on. We love our busy little schedule but there are a lot of demands that my children can have on our daily agenda. Often times it can be difficult to find enough hours in the day to accomplish everything that I’ve set out to do. 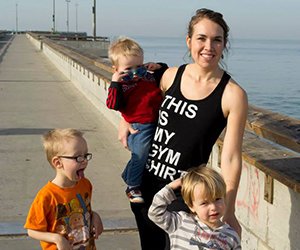 As a Mom, typically my activities hit the chopping block in a pinch, but not going to the gym. I’ve found that when I switched to Cal Fit, my gym routine stays on my schedule, which is half the battle. I find that instead of staying in my rigid gym bubble, I’ve been able to explore the different Cal Fit locations as a natural progression to keep up with my workout while amid bussing my kiddos to their many extracurriculars. What I’ve discovered is that I enjoy having a handful of different gyms to mix things up for both the kids and myself. For example, I can stop at the Rocklin gym before Thursday soccer practice, the Folsom gym after picking them up from their Dad’s house, or the Orangevale gym after leaving our weekly visit with Great Grandpa. Having so many different options all over the Greater Sacramento area with the same amazing family culture has made all the difference in the world! Folsom Cal Fit has an amazing pool with a kiddie pool splash pad. The Rocklin Sports Complex has indoor soccer that they rotate into their Kidz Klub schedule. Rocklin (on Sunset) has toddler story time for the littles with a fantastic staff that sings songs along with them. Orangevale always has great physical games that they play (tag, red-light green-light, musical chairs, etc.). Arden throws some pretty amazing parties that only a team that works together can pull off (see previous blog about their amazing Kidz Klub staff). I don’t think I’ve met a single Childcare staff member at Citrus Heights who isn’t smiling. Some Kidz Klubz do science lessons, noodle hockey, specific crafts/art projects. It really is remarkable how great the Cal Fit childcare is. So, next time you’re scratching your head trying to figure out how to get your gym time in among the chaos of meeting your children’s never ending needs, entertain the idea of looking up a different location en route to your other errands. You can also access the childcare schedules online to see what fun activities your kids can participate in at the different locations!